A grammar and proofreading seminar that is fun? Is that possible? You bet. This program is based on the latest research on how adults learn. It's fast-moving, so you stay interested. It's engaging, so you learn by doing. And it's fun, so you happily give it your all. 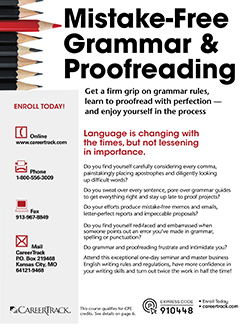 Mistake-Free Grammar & Proofreading is nothing like the grammar classes you took in school. This workshop is exciting, engaging and truly effective in refreshing you on the basics of business English. Techniques for finding errors in numbers, prices, codes, dates, etc. This training is critical for people who want their written communication to be letter-perfect. In this high-energy training, you'll try your luck with Blue Ribbon Bingo, polish your usage skills with Grammar Bull's Eye and "question the answers" with Punctuation Jeopardy. The result? The information comes alive for you. You easily see the practical applications. And it sticks with you in a way that pure "book learning" never can. Capitalization rules (Accounting Department or accounting department? Explore more dates and locations or find other related courses. "I have been a member of Fred Pryor for almost three years now and I have yet to attend a class that didn't have valuable information that would benefit my company and/or our employees." "Excellent!! As always, Fred Pryor's courses are easy to follow, very informative and presented in a format that keeps your attention!!" "I enjoy all of the seminars that I attend through the Fred Pryor Training Rewards program. They are very informative and the instructors are very knowledgeable and helpful." "Excellent info for all levels of users. There are always things to add to your "bag of tricks"." "Wow! I have taken many wonderful courses through Fred Pryor; this one takes the cake!!" "Top notch! Thank you Fred Pryor, this is the best investment my boss could have made." "I received a lot of great information in this training. Several co-workers went with me which was a great help for me to start implementing some of the changes we need to do at the office. It was very eye opening for them to realize the things that we need to do at the office. It was very eye opening for them to realize the things that need to get to me. It was like Fred Pryor and the trainer had my back!"